Note 1: This review was done using an original model Sega Master System. The Master System was connected to a 55-inch HD-tv. I used the HD Retrovision Model 2 Genesis component cable (with a small adapter piece to allow the Master System to be connected). I then ran the 240p signal through the Retrotink box, which converted the signal to 480p, a signal my Vizio could detect and output through an HDMI input. It really all sounds complicated, but works flawlessly if you have the right devices, and the picture is magnificent. Use an HD Retrovision Genesis Model 2 component cable (with adapter for a Master System) combined with a Retrotink device to display your Master System in beautiful 480p on your modern HD-tv! Brief History: Double Hawk was released only in Europe for the Sega Master System (it is fully compatible with a U.S. Master System, however). It never saw a release in the U.S.
Story: (back of the box) You control the action as John and Jack, two warriors hand-picked by the United Nations – attempt to bring down a terrorist organization which is responsible for a worldwide wave of violence! The terrorists are capable of launching attacks from the sky, the sea, and by land. Are you the one person who can end this reign of terror? Gameplay: Through 5 Missions, you have to gun down the enemy terrorists and take down their machines of war. As John or Jack (who bare an uncanny resemblance to some 1980’s action movie heroes), you move along the bottom of the screen, dodging enemy fire. By holding down Button I, you can fire an unlimited number of bullets at approaching soldiers, tanks, choppers, and other enemies (an onscreen reticule is present to show where you’re firing). You can’t move while firing in this manner however, so you have to stop to move away from bullets and then open fire again from a different spot. 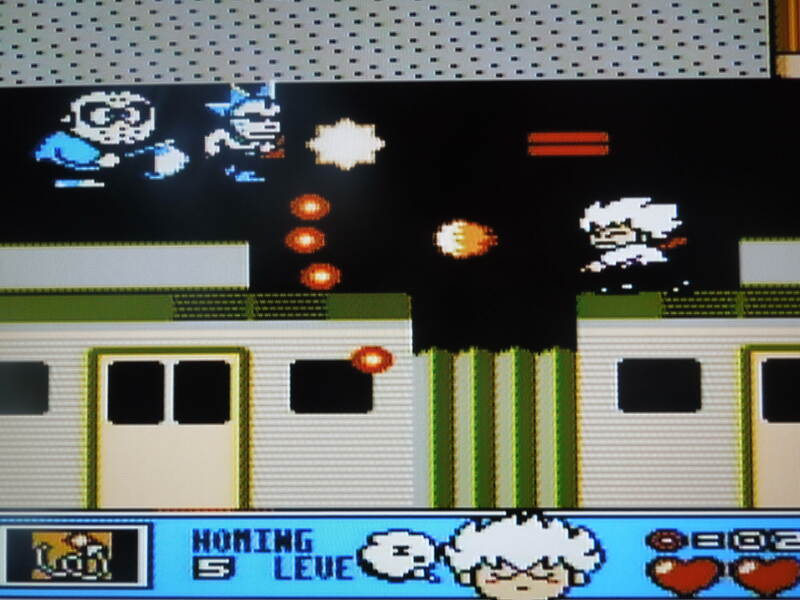 Each Mission contains four scenes – the first three have you blowing away (or evading) the bad guys until a timer expires and you move on to the next scene. In the final scene of each mission, you battle a Boss – a military base or armored vehicle of some kind, typically. The game’s best feature is, by far, the five Boss fights against heavy artillery. Power-Ups: As you shoot the enemy, occasionally, Power-Ups will appear and float down in a straight line from the top of the screen. If you move Jack or John underneath them, they’ll temporarily give your soldier a boost in one of these categories – F (speeds up your movement), R (faster bullets to eradicate the enemy quicker), S (wider reticule for shooting targets), or B (bombs that can be lobbed with Button II to finish the enemy faster than bullets – they come in supplies of 10). Lives: You get three lives, and unlimited continues. You also get points for taking out the enemy, but high point totals don’t add any extra lives. If you lose all 3 lives, you simply have to repeat that particular scene if you elect to Continue – this is nice as you don’t have to go all the way back to the first scene of every Mission each time you die. One unusual program decision, however, regards the 2-player mode. Each character gets 3 lives, yet when one player loses all of his, he automatically steals any remaining lives from the other player. So basically, what you have to do to enjoy co-op is to tell yourself (if playing with someone who may be less than skilled) that you have only 1 life and your friend gets 5 because that’s basically what it amounts to. The co-op mode is fun, but know from the start that you will automatically give any remaining lives you have to your partner should he or she lose their own! Music: There is a nice little ‘You beat the scene!’ jingle that plays at the end of each scenario, but in game, there’s nothing but the sound of your gun and bombs, plus a few other sound effects. This is unfortunate, as even a decent tune would have added to the ‘war’ atmosphere or the imposing threat of a Boss fight. Difficulty: There are two levels of difficulty – Easy and Difficult. In the Difficult mode, there are more enemies and they fire more bullets. In Easy mode, you’ll get through most of the scenes outside of the Boss fights easily, as shooting and dodging the enemy isn’t too tough. The Boss fights typically take multiple tries as you figure out which part of an enemy base to take out first, or how best to position your soldier onscreen. Boss fights generally involve dodging far more bullets than you do in the scenarios that precede them. The only one that gave me fits was the last one in Mission Five. After about 100 tries (seriously), I finally, by luck, discovered that if I took out the two lower left cannons and one upper left base first, then there was a ‘safe spot’ on the left side of the screen I could position my soldier to safely pick off the rest of the guns on the base. Double Hawk breaks the formula for an 8-bit shoot ’em up, and it does a decent job at at. The Southern Gentleman’s Opinion and Letter Grade: B I wasn’t overly impressed with Double Hawk at first, but I came back to it and came around. The control is absolutely perfect, and I like the strategy of firing, moving, and firing. The Power-Ups add a nice mix-up, as your soldier becomes much stronger with them, and if you have them for Boss fights, you’ll win quicker. The absence of music is really disappointing, but it’s not a major problem since the gameplay is good. The two difficulty levels add some replay value, although those soldiers fire much more quickly on the higher of the two! Also, there’s great replay value if you’re going for a high score – your score resets to zero every time you continue, so seeing how high you can get on 3 lives is a fun challenge. *A neat feature of Master System manuals, I have found, is the presence of ‘High Score’ tables in them for you to write in your scores. While I don’t do this with any manuals that don’t previously have writing in them, and I always rely on notebooks or printed tables for high score keeping so as not to mar old manuals, Double Hawk has one of these such tables, and I just thought I’d mention it – I wish more manuals would have included these back in the day, as trying for a high score always adds replayability.